Georgia Hall with LET Executive Chairman Mark Lichtenhei. Photo: Ladies European Tour. 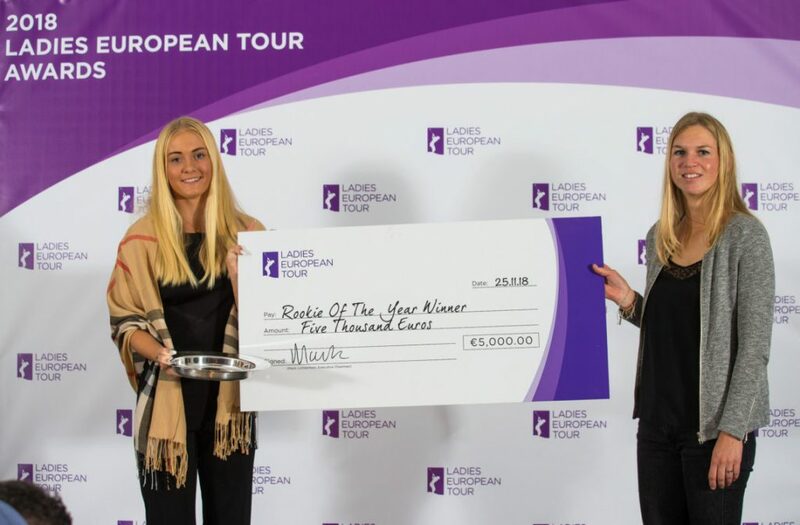 Georgia Hall officially became the youngest player to win two consecutive Ladies European Tour order of merit titles, at 22, a year younger than the legendary Dame Laura Davies in 1986. She was also named as the 2018 Players’ Player of the Year, as voted for by her fellow LET professionals, following a superb season, highlighted by her incredible major victory in the Ricoh Women’s British Open at Royal Lytham and St Annes Golf Club. 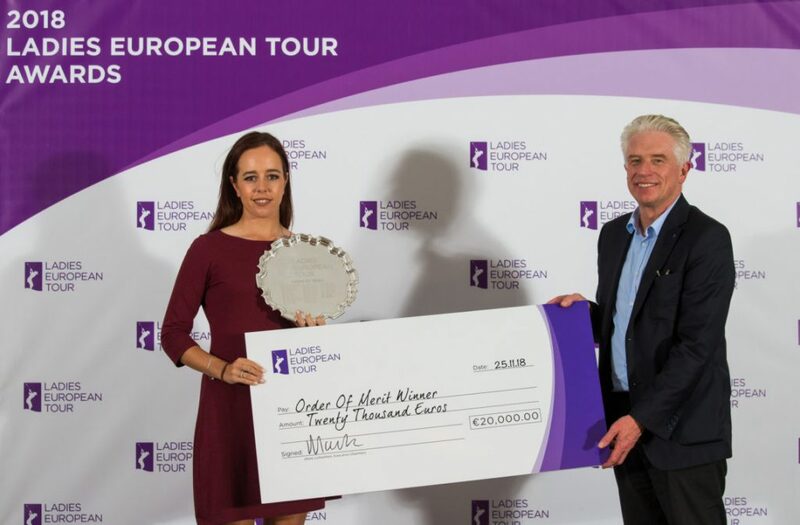 As the LET order of merit winner, she was presented with a cheque for 20,000 euros by executive chairman Mark Lichtenhein at the end-of-season awards. “It still hasn’t sunk in yet,” said Hall. “I still feel like the same person and player and enjoy playing in every tournament, just playing golf. Hall finished T3rd at the Vic Open, T9th in Canberra, T21st at the Aberdeen Standard Investments Ladies Scottish Open, first in the Ricoh Women’s British Open, T16th in the Evian Championship and T10th in the Andalucia Costa del Sol Open de Espana Femenino to crown a tremendously successful year. Her goal next year is to become the world number one: “I’m world number eight now, so that is my main goal, to become number one. I’m going to work hard in the off-season to get off to a great start next year and take the next step. Meanwhile, Sweden’s Julia Engström crowned a fantastic 2018 season by earning the LET Rookie of the Year Award, as the leading first-year member. She was presented with the award and a cheque by the 2017 winner, Camille Chevalier. The 17-year-old, who is still in her last year of high school, studying law and business, finished 17th on the Order of Merit, ahead of second-placed Manon Mollé, in 20th position. The highlights of her year included a tied fifth place finish in the Lalla Meryem Cup in Morocco, a tie for 13th in the Lacoste Ladies Open de France and a bronze medal in the European Mixed Team Championships. “This was my goal at the beginning of the year and I worked really hard for it, so I’m very happy,” said Engström, who made her debut on the LET in the 2014 Helsingborg Masters as a 13-year-old.